Pectoral cross - A104L (with chain) - Istok Church Supplies Corp.
Pectoral cross of medium size of classical four-end form is made of brass and covered with 24K silver-gilding, galvanized. The crucifix is a casted one, voluminous, accentuated by fragmentary gold-gilding. The molded volumetric decor framing the Crucifixion is decorated with excellent quality stone-phianites of various shapes of cut: marquises and circles. 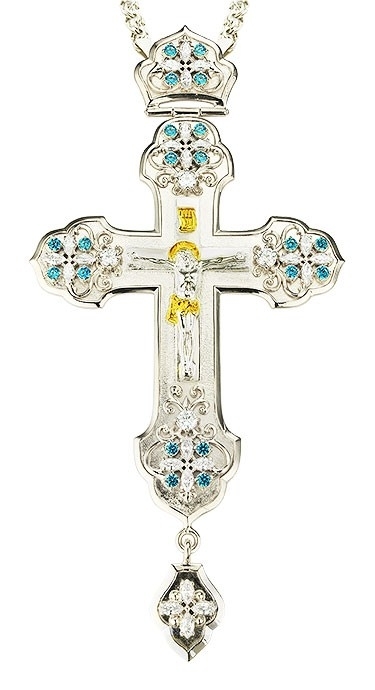 The stones are fixed by hand, which guarantees their being in their places for the entire period of wearing the cross.